Many years ago, when simplify 101 was in its infancy, I wrote a quick tip touting the benefits of Lazy Susan organizers. I proclaimed that “Lazy” Susan was a misnomer. This incredible storage solution should have been named Workhorse Susan or something else that would give this organizing superstar the recognition it deserves. 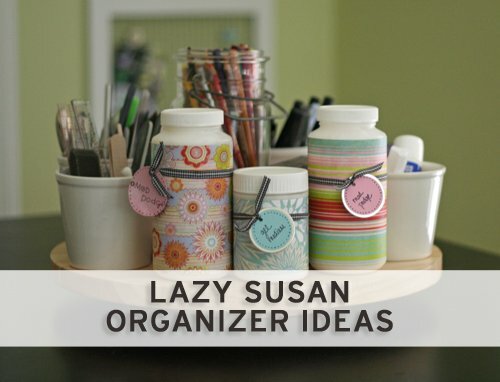 Years later, while other organizing ideas have come and gone from my favor, Lazy Susan still reins queen. This week, while tidying my pantry, I remembered my love of this amazing storage solution. I have four 18” Copco Cabinet Turntables in my pantry. See, the shelves in my pantry are very, very deep. And while this is great for storing lots of stuff, it is not so great for retrieving lots of stuff. That is, until you add a Lazy Susan. Suddenly, items that would have gone missing in the deep, dark corners of my pantry are easily brought into sight and reach, all with the simple spin of my beloved Susan! In the kitchen. 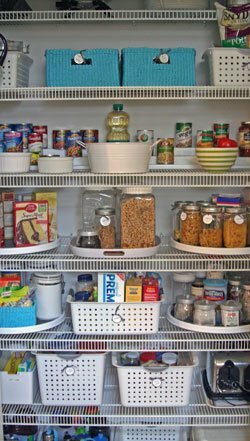 Use a lazy Susan in deep cabinets like under the sink, or on deep shelves like the ones in my pantry. Or use a small, double-decker Lazy Susan in upper cabinets. They’re great for storing spices and other small items that would otherwise get lost in the back of the cabinet. A large lazy Susan is fabulous in the refrigerator. Say goodbye to science experiments formerly known as last week’s forgotten dinner. In the bathroom or linen closet. Use a turntable to store toiletries, makeup or other small items in the cabinet under the sink. Or store extra and infrequently-used items on a Lazy Susan in the linen closet. In the craft room. Keep often-used craft supplies in reach and in sight. This would be a great place to use a nice decorative Lazy Susan like this wooden one. I wrote more about using Lazy Susan organizers in the craft room in this post. Are you a fan of the Lazy Susan like I am? Where do you have them in your home? Share your thoughts in the comments! I really like lazy Susans as well. My husband not so much, he feels you loose space in the corners. Still. I got us 2 wooden lazy Susans last year to store things like whisky, brandy etc. – indeed, as described in this post on deep shelves towards the bottom of a built in closet. When entertaining we no longer have to sit on our knees and dig through the bottles and get half of them out of the closet, we can simply spin the wooden circles. And no… we don’t drink or serve hard liquor that often, that;s why they are not on eye level ;-)). Thanks, Petra. I was going to mention the objection about losing space. To me…what you lose you gain in accessibility and usability of the space! Totally worth it in my opinion. Sounds like you’ve seen similar benefits. So very clever! This was the answer to my oil organizing woes (yes, they WERE woes!). Because I have the wire shelves in my pantry, the smaller bottles often would get knocked over, but not any more! Thank you for some great inspiration! Yes, another great benefit of the Lazy Susan. Small items stay standing up on those wire shelves, and crumbs also stay contained. I find that my items on lower shelves are much cleaner now that I use the Lazy Susans! Thanks for your comment Cathy. I, too, have several Lazy Susan’s that I use to house the different spices, oils, and vinegars in my kitchen. I also have one on our dining room table which holds our napkin holder, salt & pepper shakers, and flower vase. In my craft room I use the Pampered Chef Tool Turn-About. I’ve also tried it inside the refrigerator, until I switched to rectangular bins. However, I’ve never used them in the bathroom. I will try that next. Thanks for posting this article. The dining room table idea is terrific! Thanks for sharing Maryza! I love them too. It’s true that they technically waste some of that corner space in a cabinet, but I think the benefits often outweigh that. I like them on upper shelves where it would be hard to see items in the back, whether or not the shelves are deep. (Mine aren’t.) I also have one on a very high shelf–I love that one, because the only way I can reach items there is if they’re right on the edge, and with the lazy susan I can rotate whatever item I need to that position. Good point about the higher shelves. I hadn’t thought about that application! I absolutely love them! I have two in my pantry (plus a double decker spice one) and one in my fridge. I use one for the kids’ craft table as well. I would like more but I wait until I see them in thrift stores. I haven’t seen a good one in awhile but I always keep my eye out for them. They have so many applications. I need one for my laundry shelf as I am quite short and the shelves are a bit high. I can reach the front of the shelf over the washing machine but not the back. It would help me a lot there. The laundry room is a great idea!! Thanks Catherine! My friend thinks I’m super organized because I have my spices on a Lazy Susan and they are alphabetized! The truth is they’re easier to find that way. Even on the Susan I could go around several times looking for something, but this way I know exactly where they are. 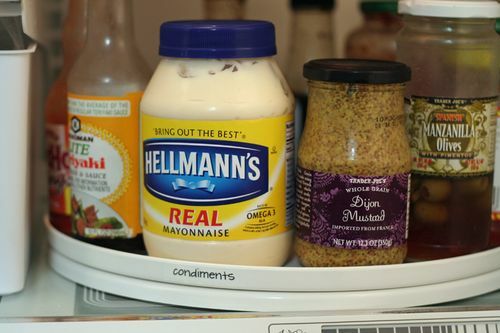 I also use one above my microwave with other condiments and oils. Another thing I’ve seen put in a corner cabinet that was hard to reach into was prescription and otc meds. Again these can be put in an order, say the morning pills together and the evening pills together, etc. (obviously away from children) I agree with Catherine that they are expensive, so I too wait to find a good buy. Loved the comments of the ladies. My other absolute space saver is one my husband fought me on, but if you install roll out shelves in your cabinets, but put the bottom one a few inches from the bottom of the cabinet. You can slide things under the roll out shelf and put things on the shelf that aren’t so tall. I think most shelves are installed too far apart and waste valuable space. I alphabetize my spices on a lazy Susan, too. Seems over the top…until you try it and realize how much easier it is that way. When we remodeled our kitchen years ago I had 2 large lazy susans put in the bottom two shelves of the two corner cupboards and one lazy susan on each of two shelves in the corner appliance garage. They are wonderful. I still use the double lazy susan for spices that I began using 40 years ago plus I have two in the bathroom. Do I like them? YES! I also had two roll our shelves in stalled when we remodeled and agree with Jeanne that they are fantastic space savers and make it so east to get my pans out. I agree with you both, pull out shelves are fantastic!